Plot Summary: Mary Lennox recently became an orphan because her parents died from a cholera epidemic in India so she was sent to live in England with her uncle. However, her uncle is a very distant man who talks to noone so she is left alone in the mansion with nobody to play with. Soon she meets a friendly servant boy named Dicon and his older sister Martha and they soon become good friends. 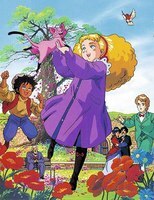 Later on she discovers a secret garden and hopes it will bring happiness to her new family, including her cousin Collin who is crippled. Not related to the manga of the same title.